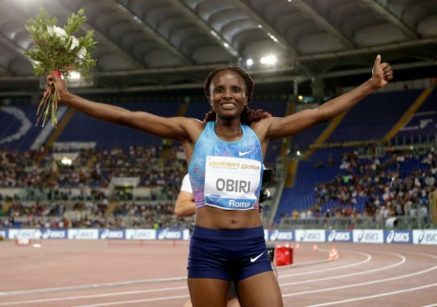 8th June 2017 – Olympic silver medallist Hellen Obiri (KEN) continues to go from strength to strength and added record to her growing list of achievements in Rome on Thursday night. Having already run the world leading time over 5000m in Shanghai last month with a dominant piece of front running, here Hellen was more patient and sat among the lead group for the first half of the race. With the tempo dropping lower than she liked Hellen then chose to blow the race open with a 65 second eighth lap and backed this up with a 66 second ninth. This left her clear on her own and only racing the clock. With another display of speed and strength Hellen finished in style crossing the line in 14:18.37 to set a new 2017 world leading time, a new PB and finally a new Kenyan record breaking that of fellow PACE athlete and Olympic Champion Vivian Cheruiyot (KEN). There was also another big breakthrough for Winny Chebet (KEN) over 1500m. Having run most of her career to date over 800m Winny ran a very encouraging 1500m at the end of last season, now she can lay claim to being a truly world class 1500m runner after taking second place in Rome with a storming finish and smashing through the 4 minute barrier for the first time stopping the clock at 3:59.16.